In diabetes, the amount of sugar increases in blood due to insufficient production of insulin from pancreas. It means, the main focus should be given in insulin secretion and pancreas functioning mechanism. The natural food stuffs that are available at your home and kitchen can play an important role in treating of high blood sugar. These simple and easily accessible home remedies can cure diabetes permanently. Simultaneously, one should take care of physical activity, stress and what should one eat and what shouldn’t eat. Bitter gourd: Diabetes patients should give weightage to bitter gourd juice as it contain hypoglycaemic bio-chemical substance, which is useful to treat the high level of sugar in blood thus helpful in the management of diabetes-Type 2 and type 1. Method: ½ cup of bitter gourd juice in the morning is one of the best remedy for it. 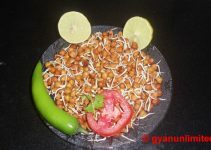 Bengal gram: Eating Bengal gram is one of the best examples of glucose tolerance thus reduces the risk of diabetes. It s said that gram is also good for chronic diabetes. Bitter melon: Bitter melon is known as anti-diabetic because of the presence of charanti and polypeptide-p, which are good in lowering blood sugar level naturally. Method: Take ½ to ¼ cup of bitter melon juice in the morning..
Fenugreek seeds: Its seeds contain galactomannan, which is good in lowering the rate of digestion and absorption of carbohydrates. Method: 10 gram of fenugreek seeds soaked in 1 cup of hot water is recommended. Indian gooseberry: Eating of amla helps to control high sugar level. It also contains chromium, which regulates carbohydrate thus good for insulin. Method: The mix of Indian gooseberry and bitter gourd juice ensures to stimulate the pancreatic cells and reduce blood sugar. Jamun: Eating of Jamun is beneficial in insulin regulation. The chewing Jamun leaves (4 to 5 ) in the morning and evening also shows positive result in diabetes. Bay leaf: Taking the mix of bay leaf + turmeric + aloe vera gel (½ tsp) before lunch and dinner is beneficial in lowering of sugar. Mango leaves: Take mango leave and one glass of water. Now, left it overnight; drink it after filtration, good for sugar patient. Turmeric powder: The mix of honey + turmeric powder + dried gooseberry powder also shows positive impact on diabetes. Curry leaf: Chewing of curry leaves twice or thrice a day is beneficial for the patients. Take Rose apple, Bel and Neem on empty stomach. Methi seeds (100gm) , turmeric (50gm), white pepper and a glass of milk. Amalaki Churna, Turmeric powder and Naag Bhasma. The following naturopathic treatments are beneficial in the treatment and management of diabetes. Amazing article. The efforts put into writing this article is really commendable and worth sharing to those suffering from this ever-increasing and deadly disease. I really appreciate the serious and selfless attitude towards writing this blog. This is the best easy remedies to manage diabetes. Thank you so much for sharing such kind of news.